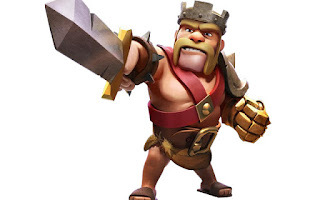 The Barbarian King is the leader of all units of the game and he is bigger and stronger than other units. When the altar is build barbarian king will automatically spawned on your village for the cost of 10,000 Dark Elixir. Best about him is once summoned he never dies (an Immortal) but if he's injured badly or fallen during battle then he needs to regain his health by sleeping for a period of time. While at Guard Mode, the Barbarian King will drift in circles round his Altar, sometimes seen leaping over walls too. While in sleep mode he can't attack or used for a fight, sleep duration depends on the current Level of the Barbarian King + the damage needs to be recovered, means more the Level and Damage is, more the health regain time. Additionally Gems can be used to increase the healing rate of the hero. If yo see an enemy Village with en Empty Altar it means the enemy Barbarian King is in sleep or getting upgraded. 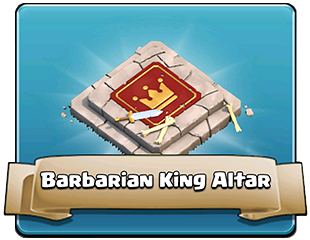 What are the Levels & How To Upgrade Barbarian King? Level starts from L-1 and ends in L-40, He can be upgraded using Dark Elixir, when he's upgraded he gain more power, hit points, attack and strength at each level, to upgrade Barbarian king it'll cost L-1 = 10,000 Dark Elixir, L-2 = 12,500 Dark Elixir, L-3 15,000 Dark Elixir and it grows with each Level. At level 5, the Barbarian King gains an Special Ability called "Iron Fist" which can be used on the battlefield. It partially heals him, summons around twenty additional Barbarians and grants that the Barbarian King and some other surrounding Barbarians increased speed and damage. What is the building time of Barbarian King? Starting from 12 Hours and to Six days until reach Level 15 and after level 15 it's always Seven days. Is Barbarian King worth it? It looks like it requires lot of Dark Elixir to upgrade him but in the game he'll be your most valuable Strategic unit when combined with other units because he's Immortal, Great Hit Points, Massive Attack and Strength + his Iron Fist Ability. 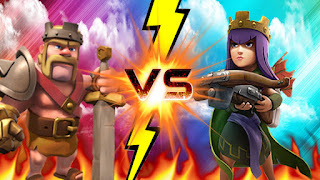 Barbarian King Vs Archer Queen Which one is Better? Can Barbarian King Defend and Attack while in asleep? Barbarian King is in asleep because he was defeated in battle and lost hit points and is regenerating health. During this time he will not be able to defend your village from attackers. 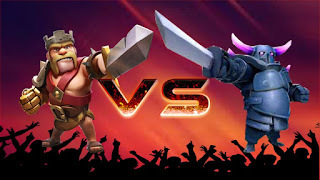 Barbarian King vs PEKKA Which one is Better? Also PEKKA are fantastic units, it is difficult to overcome the Barbarian King. He might be pricey obtain but the simple fact that he can be utilized over and over way you will not need to pay out a great deal of funds every time. A Barbarian King may also be updated to finally have more hit points and strike power than even the maximum level of PEKKA. The Barbarian King works good together with your main attack forces since he adds a few tanking power with his enormous hit points and also adds great amount of damage combines with his special ability Iron Fist. Not like the Archer Queen, the Barbarian King doesn't come in handy when it comes to destroying buildings and air units and constructing a funnel to the troops. The main reason is as simple since it's clear that the Barbarian King is slow, does not deal that much harm with no capability and can not take anything down contrary to a wall without needing to damage the wall first. Doesn't protect the whole area but around the Altar.